The Cumulative Impact is the main methodological tool used in ADRIPLAN to evaluate the potential impact of maritime activities on the environment, quantifying the pressures generated by the uses on the environmental components (in the current and future scenarios). Cumulative impacts are a key point for the construction of maritime spatial plans using an Ecosystem Based Approach (EBA). The analysis of cumulative impacts aims at identifying areas in the sea where the environmental and ecological components are more exposed to anthropogenic pressures that negatively affect them. In ADRIPLAN, the general method and formula proposed by Halpern et al., 2007 has been adopted. The Cumulative Impact (CI) tool developed in ADRIPLAN was updated within the Italian RITMARE Flagship Project, with the addition of new functionalities. New features consist in: review and integration of the sensitivities (at the current stage the CI incorporates 516 definitions); refinement of the spatial dispersion model (spatial convolution); modulation of CI considering additive, synergetic or antagonistic impact phenomena; integration of land-based activities (LBA); modelling of non-linear response of environmental components to specific pressure; Spatial Uncertainty Analysis of the CI assessment. It is currently used to support an MSP exercise on the Emilia-Romagna Region (Italy) waters and case studies analyses within the SUPREME (Supporting maritime spatial Planning in the Eastern Mediterranean) project. The tool is presently integrated in the ADRIPLAN Portal. Which is the impact of human activities on the environment? How are the impacts spatially distributed throughout the planning region? Which is the most impactful activity on the environment? Which is the most sensitive/vulnerable environmental component? Which is the map of the most and least impacted areas within a planning region? What is the role of land-based activities in the cumulative impacts estimates? 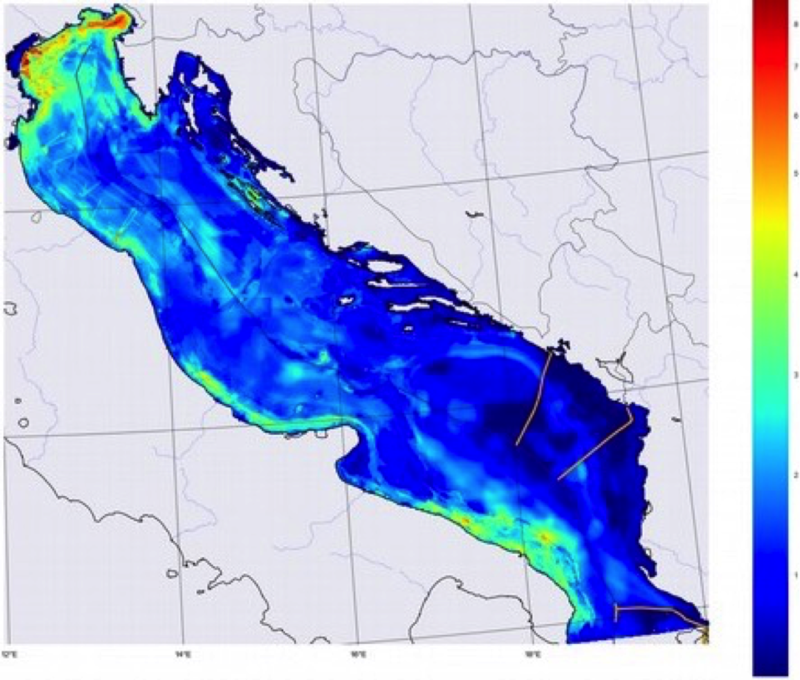 The cumulative impacts tool was the main methodological tool developed and used in the ADRIPLAN project and has been significantly improved in the Ritmare Project, in order to evaluate the potential cumulative impacts of various maritime activities on the environment in the Adriatic-Ionian macroregion. The tool was tested for the Adriatic-Ionian sub-basin, but can be deployed to any research area around the globe. It has been developed with the intent to be a useful instrument for supporting the construction of future maritime spatial plans under an Ecosystem-Based Approach (EBA). obtaining a first estimate of the contribution of the land-based activities on the estimates of the cumulative impacts, through the integration of numerical models (shallow water hydrodynamic finite element model) into the methodology. The analysis of cumulative impact is based on the methodology implemented on the basis of the best available knowledge on the subject and adapted to the characteristics of the Adriatic-Ionian sub-basin. In particular, the formula applied is the one proposed by Andersen et al., (2013), which integrates Halpern et al. (2007) methodology with the contributions of the pressures generated by the anthropic uses on the environmental components, answering to MSFD (2008/56/CE) requirements. For the complete description of the method please see (Barbanti et al., 2015, Gissi et al.). Significant improvements to the original ADRIPLAN tool have been introduced within the Ritmare project, considering the new available literature in this field (Halpern, B.S. & Fujita R. 2013 , Halpern et al., 2015 , Stock, A., & Micheli, F., 2016 ) and overcoming some critical issues detected in the previous formulation. Improvement occurred in the understanding of both anthropogenic components and natural components, the quantification of pressures and the sensitivities of the environmental components towards different pressures. Innovations introduced in the tool include the definition of a new and more robust model formula, allowing for example to discriminate among different use intensities of the marine space, to manage non-linear response functions and non-additive combinations of impacts. Furthermore, the characterization of the impacts produced by the land-based activities (through the implementation of numerical models) can be included in the final estimates of cumulative impact. The cumulative impacts tool currently allows authorised users within the ADRIPLAN Data Portal to run experiments, simulations and analyses about the cumulative impacts calculation, interacting directly with the data stored inside the Portal. These users have the possibility to access a restricted area where it is possible to configure several scenarios (case studies), by setting up the study area, the grid resolution and choosing, among the data layers collected in the ADRIPLAN Data Portal, which maritime uses and environmental components to consider for the definition of the cumulative impact analysis. Users can also upload their spatial data layers to the ADRIPLAN platform and create independent case studies analyses. The purpose is to make the application available to all users of the Data Portal in the near future. Computation and visualization of geospatial results of the Cumulative Impacts (CI) assessment. The tool enables identifying the main environmental pressures emerging from each maritime activity and localizing them in the marine space, thus identifying the most impacted areas, as well as areas with similar behaviour in terms of patterns of cumulative impacts. Analysis of the gaps in terms of availability and quality of input data. The tool is configured as a plugin in the GeoNode platform and thus its use can be replicated for any data portal that uses such technology. The release of the python tools under a GPL licence  is a guarantee of possible future extensions and adaptation to other environmental domains and applications. Funding Source: the cumulative impacts tool was developed within the ADRIPLAN project, funded by EC DG MARE. Further update of the tool was funded by the Italian Ministry of Education, University and Research within the Ritmare Project. Costs: not possible to be defined, as part of the overall funds to the ADRIPLAN and Ritmare projects. Andersen, J.H. & Stock, A. (eds. ), Mannerla, M., Heinänen, S. & M. Vinther, M., 2013. Human uses, pressures and impacts in the eastern North Sea. Aarhus University, DCE – Danish Centre for Environment and Energy. 136 pp. Technical Report from DCE –Danish Centre for Environment and Energy No. 18. http://www.dmu.dk/Pub/TR18.pdf. Halpern, B.S., Selkoe, K.A., Micheli, F., Kappel, C.V., 2007. Evaluating and ranking the vulnerability of global marine ecosystems to anthropogenic threats. Conservation Biology 21, 1301–1315. Barbanti A., Campostrini P., Musco F., Sarretta A., Gissi E. (eds.) (2015). Developing a Maritime Spatial Plan for the Adriatic –Ionian Region. CNR-ISMAR, Venice, IT. Halpern, B.S. & Fujita, R. (2013) Assumptions, challenges, and future directions in cumulative impact analysis. Ecosphere, 4, 1–11. Halpern, B. S., Frazier, M., Potapenko, J., Casey, K. S., Koenig, K., Longo, C., & Walbridge, S. (2015). Spatial and temporal changes in cumulative human impacts on the world/'s ocean. Nature communications, 6.